During Valentines Day, amaze your partner or spouse by endowing to her this Emotional Absorption Valentine Mark and let sentiments get transferred from your mind to her mind in a saturating manner. 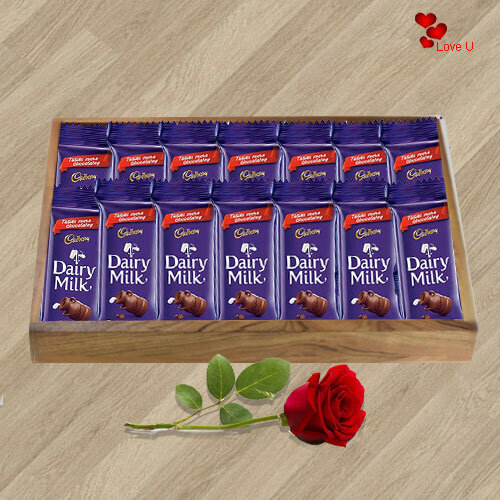 This over-flowing Amore Mark is composed of 1 plush Red Rose and 15 luscious Bars of Cadbury Dairy Milk Chocolates (13 gms each). Flowers Delivery Nanded, Send sweets Kanchikacherla, Wedding Cake Pimpri, Diwali Mithai Rishikesh, Send Flowers and Gifts to Ratnagiri, Online Shop Satna, Flower to Srikalhasti, New Year Flowers Jalna , Fresh Fruits Aurangabad, Send Gift Tiruvananthapuram, Dry Fruits to Nellore, Birthday Delivery Bokaro, Sending to Bhilai, Flower shop Bareilly, Tellicherri Online Cake Delivery.